Nestled into a spacious 0.8 acre property, this spectacular, custom built, in-town home sits at the end of a quiet, private street. Surrounded by solitude it is easy to forget that with quick & easy access to Rodeo Road, St. Francis Drive and I-25 you can be anywhere in Santa Fe within minutes. Inside the 2,150 sq.ft. 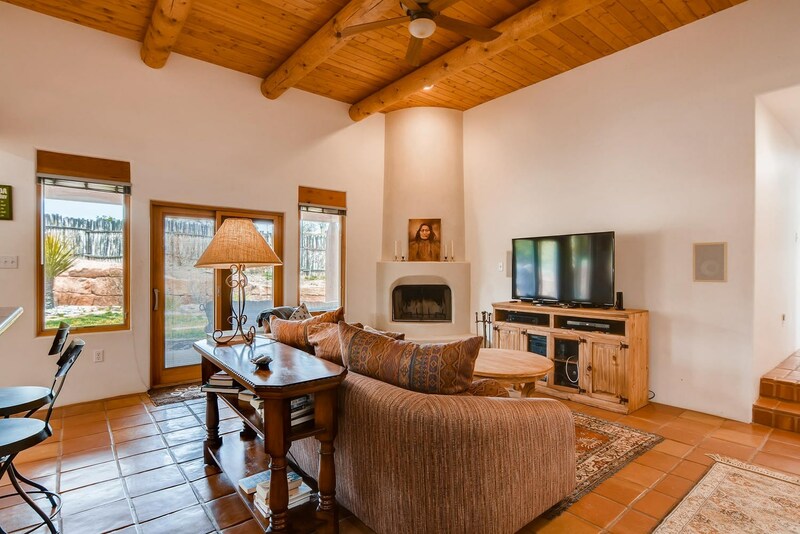 home is an inviting open living/kitchen area, complete with vigas, beams, tongue & groove ceilings, and saltillo tile floors. For those who love to cook, a thoughtfully designed kitchen awaits, complete with ideal work triangle (cooktop, sink, refrigerator), granite counters, custom cabinets and stainless steel appliances. A formal dining room ensures years of large feasts with loved ones. Throughout the interior of the home you will discover natural light in every room, Pella windows, in-floor radiant heat, a private office with kiva fireplace, and Jack-n-Jill bathroom off the guest bedrooms. For early mornings sipping coffee with a book, or evenings grilling out with friends, the expansive back portal with a generous kiva fireplace, surrounded by fencing and extensive rock wall hardscaping, is the perfect location to relax and slow down. To top it all off an oversized two-car garage will easily accommodate all your vehicle and storage needs. Don&apos;t miss out on seeing this property for yourself! Directions To Property: St Francis To East Sawmill, Left On Sol Y Nubes To The End Of The Cul-De-Sac.